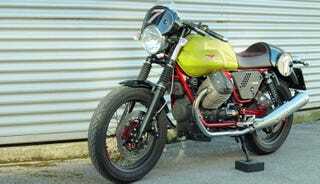 Bringing back fond memories of an icon from an era gone by, Moto Guzzi has unveiled Moto Guzzi V7 Racer Verde Legnano Special Edition, which pays tribute to the 1971 Telaio Rosso Moto Guzzi V7 Sport. It was given the fancy name,"Verde Legnano," due to its lime green paint scheme. The original was a legend for the right reasons—it was among the first five-speed motorcycles with a top whack of 120mph. Designed by Lino Tonti in 1971, it came with a 748cc V-Twin unit and production was limited to 150, with each flaunting a red frame. Now that we've gone through the back story, let's get down to the reincarnation part of the tale. The new version sports a café racer style fuel tank and has a 744cc V-Twin that belts out 49.6bhp and 58Nm of torque. Taking care of the transmission duties is a 5-speed gearbox. What's really nice is the return of the tubular red colored double cradle frame, which also features a detachable rear subframe. The born again V7 Racer Verde Legnano can be yours if you are willing to part with $10,999. The manufacturer is making the special edition more exclusive than the original—only 50 will be made and they will be available in North America only. This post was written by Sanjoy Alexander.